Let’s say you need to compensate for something—no, no, we’re not saying what, we’ll just let it go at that. Whatever your compensatory need, you could do far worse than today’s Nice Price or Crack Pipe Ram, since it’s hella big. Let’s if its price is too. We generally don’t like broken cars here because they need work to be made drivable and let’s be honest, we’re all pretty lazy. That didn’t stop yesterday’s 1995 Mitsubishi 3000GT from earning itself a narrow but decisive 53 percent Nice Price win however. A modest $1,350 price seemingly outweighing its need for some serious headwork meaning somebody better get cracking. Have you ever heard the phrase go big or go home? Could there be a more extroverted declaration in existence? Extroverted—and big—perfectly describe today’s 2008 Dodge Ram 2500 Mega Cab pickup truck. Hell, even the name is exorbitantly long. When it comes to vehicle sales here in America, the pickup truck is king. Ford’s F-series has been the number-one selling vehicle here for decades running. Chevy’s trucks do alright too. Mopar’s Ram brand sells in significant numbers too, but they consistently come in a distant third. When you’re the underdog, you try harder, and it’s hard to imagine a truck that tries harder in any context than this custom kitted Mega Cab. First of all, it’s big AF. This truck rolls on a wheelbase that’s a full 160.5-inches hub to hub. To put that in context, a Volkswagen Golf is only seven and a half inches longer, overall. The Mega Cab model matches the Quad Cab long-box chassis with a shorter six-foot bed in back and a cabin stretched almost 20 inches in front. That allows for NBA level legroom in the rear row, and even the ability to recline the backrests back there if you’re feeling in need of a nap. If you regularly travel with somebody who lays it a little too heavy on the Axe body spray, this is the kind of vehicle with the room to ensure your olfactory sense some personal space. The truck’s tall too, however that’s the result of some aftermarket efforts. It rides on a 10.5-inch with ladder bars in back and thick as your wrist coils up front. And yes, the truck sports 4WD. 20-inch tires add to the climb. Powering the beast is a 325-horsepower/650 lb-ft of torque 6.7-litre diesel. That comes by way of Cummins and rocks a turbo along with its six cylinders. A 4-speed automatic and two-speed transfer case do all the cog-nition. This being a 2500 edition, it offers up a staggering 12,900 pound towing capacity. The whole thing has just 108,000 miles on the clock, with the tires only having 10K under their tread. I’ve left discussion of the truck’s physical condition for last because, well, it’s out there. When I said this was an extrovert’s truck I was being dead serious. This Ram comes primarily in a merlot over gold color scheme with a fade transition in between. Along with that you get animal print flares, door handles, and bumper covers, plus a good bit of chrome. Everything looks shiny and new and there’s an aftermarket cap for that truncated bed in back. Inside things get even more wild. The kitty print extends in here, covering the door cards and creeping up the pillars. It’s joined by grey reptile patterned seating sections along with your more traditional dark grey leather and vinyl in other places. The upholstery is said to be one-year new. This being the Taj Mahal of Ram pickups, it sports each and every convenience feature known to 2008 man. 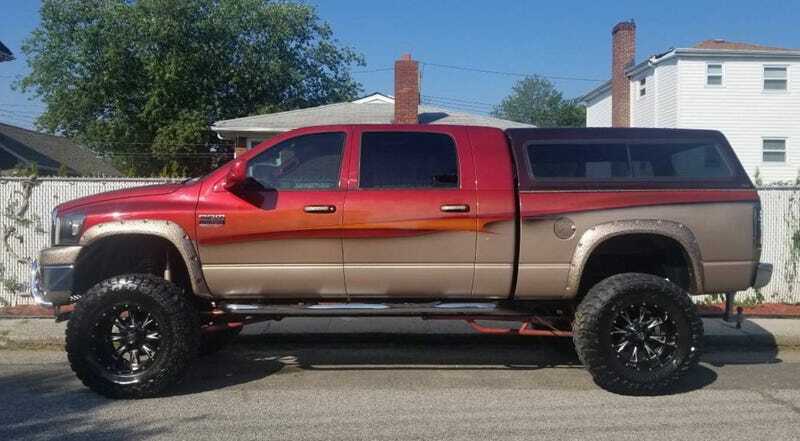 There’s plenty of aftermarket goodies on the truck too, and in fact the seller claims that it would cost six figures to replicate its loud and proud appearance. I say, why would you when for $39,999 you could simply buy this one and be done with it? That’s the asking and while it may demand the filling of two meters every time it’s parked on a city street, the ad avers that the truck needs nothing. Now, I would guess that you’re looking at this beast and are slowly shaking your head and muttering nuh-uh over and over again. No, it’s not a truck for the masses, even if it is massive—8,800 pounds!—but that doesn’t mean it must be ostracized. No, there is a market for trucks like this, it’s just a pretty small demographic. Hopefully it’s a small but flush one too, since $39,999 is not chicken feed. What’s your take on this huge truck and that almost as big $39,999 price? Does that seem fair for all the custom work and owning the tree huggers? Or, is that, like the truck, just too damn much? Staten Island, NY Craigslist, or go here if the ad disappears. H/T to Lou Dubrosa for the hookup!